Mall of Istanbul , is one of the largest shopping malls in Turkey and presents the famous brands in the world and Turkey. Mall of Istanbul shopping center provides a modern unique design which stands to be Turkey’s top functional shopping mall with its concept. There are 350 stores, food center, MOi Park, the first uniquely designed theme park, traditional arts street and performance arts center, Mall of Istanbul opened to visitors on 23rd May and is developed by Torunlar GYO, the largest domestic shopping center investor of Turkey, with an investment of 1.3 billion TL. With a total of 350 shops Mall of Istanbul sees the world’s and Turkey’s leading brands with its leasable area of approximately 156 thousand square meters. At MOI where Migros, Koçtaş, Media Market, Teknosa, Zara, Mudo, YKM are the top stores, Toyzz Shop opened its biggest store and Victoria Secret has its stocked concept store in Turkey. Debenhams opened its second store with a new concept in Turkey at MOI and additionally, MOI hosts one of the biggest stores of LCW in shopping malls in Turkey. Miss Selfridge of Britian and Decathlon of France are just some of the world famous brands that opened their stores for the first time in The Mall of Istanbul owned by Torunlar REIC. Istinye Park shopping mall facilitates 300 stores leading local brand names and global brands, the first IMAX Theater, cafes, and exclusive restaurants. With a city lifestyle atmosphere Istinye Park shopping center situated on a natural topographical “amphitheater” of residential neighborhoods. On top of a grand circular entrance plaza settles amid an open-air lifestyle center and a glass-roofed indoor retail area. In addition to the many alluring stores and a chic theater complex, the fashionable mall hosts a variety of cafes, restaurants, and a food market. The shopping mall proves that it’s contrasting to its customers since the opening with the assorted living spaces. New concept such as The Boulevard, The Square, The Fashion District and the nostalgic Market Place. The shopping mall offers many luxury famous brands including ; Dolce & Gabbana, Dior, Prada, Celine, Fendi, Hugo Boss, Max Mara, Zara, Boyner, Mango, M.A.C., Sephora, Sevil, Vakko, and Debenhams. The most exclusive stores are positioned outside at the open-air lifestyle center which is entered from the upper floor. Istinye Park Brands Street, an open space designed as a city square that is a first in Turkey. The city square displays abundant brands of fashion such as Burberry, Gucci, Miu Miu and Louis Vuitton, and restaurants with different foods . The new meeting venue in Istanbul is Zorlu Center. Featuring 5 star Hotel, offices, residence, performing arts center and luxury shopping center. Zorlu shopping mall has 180 different stores. Apple introduced the iconic cube store concept, unique to New York, in its first store opened in Turkey. Beymen, set on an area of 9.600 m², introduces a brand new concept to the visitors at Zorlu Shopping Mall. Brooks Brothers, Industrie Denim, Cos, Lanvin, Pomellato, Stella McCartney, and Superdry are additional brands adopting Zorlu Shopping Mall to open their first stores in Turkey. Zorlu shopping mall has many attractive fashion names including Dolce&Gabbana, Valentino, Saint Laurent, Tiffany& Co, Fendi, Dior, Louis Vuitton, Prada, Burberry, Cavalli, Michael Kors, Moncler, Mont Blanc, Vakko, Sevan, Sponza, Urart, Max&Co., Beymen Club, GAP, Derimod, Pinko, Faconnable, Tommy Hilfiger, Gant, Network, İpekyol, Abdullah Kığılı, Koton, Mango, Yargıcı, and Lacoste as well as the largest H&M store in Turkey on an area of 3.000 m². Zorlu Shopping Mall established a contrast with its gourmet concept. International Restaurants Eataly, Jamie’s Italian, Tom’s Kitchen and Morini are brought into Turkish markets for the first time. Local restaurants such as Köşebaşı, Günaydın, Far East and Welldone designed brand new concepts for Zorlu Shopping Mall. 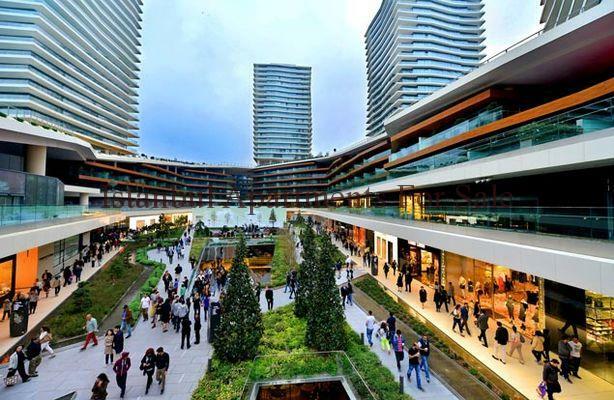 A metropolitan oasis in Istanbul Kanyon shopping mall is outstanding opened in 2006 with 26 tower floors, 170 luxury residences and retail area of 400.000 square feet . Kanyon shopping center is a blend unique advance with retail in an architectural shell plus entertainment. Top world and local brand names featuring 160 stores Apples first store in continental Europe and world famous fashion at Harvey Nichols, 9 cinema screens, fitness center, cafes and live open air performances. On the Asian side of Istanbul is Palladium Istanbul shopping center , Lifestyle areas featuring superior international and Turkish brand name stores . The Palladium in Istanbul is famous for its huge glass sphere and is one of the most recognizable sites in the city, 190 stores spread across five floors. Located in the center of the dynamic Atasehir district offering a diverse range of local and international brands. The Palladium in Istanbul cost almost $230 million to build and opened its doors in 2008. The elegant masterpiece is home to 190 retail stores, making it one of the biggest shopping malls in Istanbul. With designer fashion stores such as Guess, Michael Kors, Tommy Hilfiger, Zara and Pierre Cardin or shop at outlets for brands like Adidas and Gap. The Palladium shopping mall is family friendly with a huge food court offering over 20 restaurants, cafes and a theatre. Akmerkez shopping centre the most award winning in Istanbul. 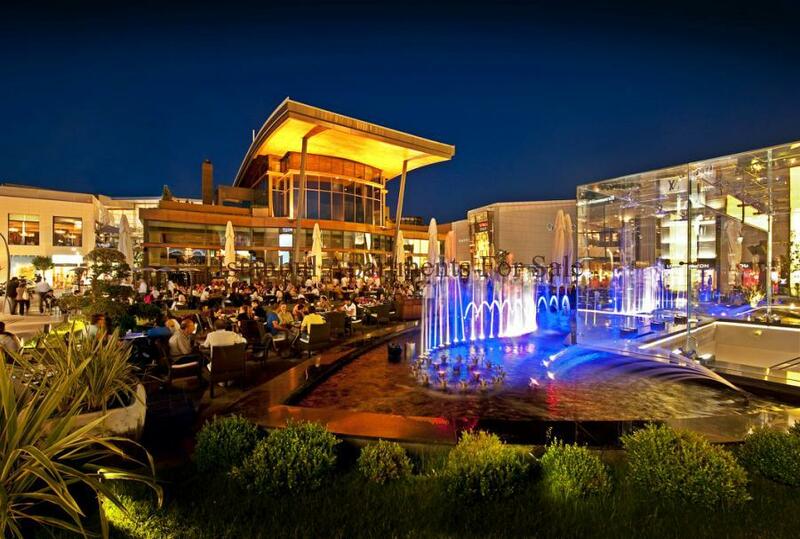 In 1995, the International Council of Shopping Centers (ICSC) selected Akmerkez as the Best Shopping Center in Europe. In 1996, Akmerkez was given the award for recognition as the Best Shopping Center in the World by ICSC and also earned the highest accolade, Design and Development Award. Akmerkez, boasts 246 stores offering excellent women’s, men’s and children’s clothing and textiles, stationery, toys, sports, shoes, eyewear and gift shops along with restaurants, cinemas, hairdressers, banks, a currency exchange office, electronic goods, orthopedic goods, shoe shine services, a tailor, a pet shop, and a supermarket for all the shoppers needs. Akmerkez, lately publicized a 25 million dollar refurbishment plan to continue their No.1 status. The new layout will include a renovation of the interior design, exterior architecture, lighting, signage, and an expansive, modern style restaurant and food court. The shopping center will be improved to accomplish a brand new sense of luxury lifestyle shopping. Trump Towers shopping mall Istanbul, opened on 19th April 2012, the first venue to hold the Trump name in Europe. Bringing a new shopping style to the 5th biggest city in the word. Located in Şişli district of Istanbul the shopping mall covers a total area of 43,600 square meters offering a merge of entertainment, restaurants and 175 fashionable stores. The total construction area of the towers is 260,000 square meters, including the 37-story residence tower and the 37-story office tower. One of the prime additions is a shopping center for children, covering an area of 9,000 square meters, where children are able to entertain and participate in activities. The “Children’s Store” designed particularly for children, will also bring Turkey’s first Disney Theater, with a capacity for 600 people. Pure Fitness, a leading world fitness brand, offers services in a 3,300-square-meter area. Istanbul’s European side holds the largest shopping center Forum Istanbul . It has approximately 20 million visitors per annum. With 280 international and national brand name stores the shopping mall employs 5,000 people. Forum Istanbul is located in Bayrampaşa, built on an area of 495,000 square meters, consists 175,000 square meters of leased area plus an IKEA store 30,000 square meters and a Real supermarket covering about 15,500 square meters. It also has public areas and parks where festivals, as well as cultural and sporting activities, take place. Retail names such as Tepe Home, Saturn, Teknosa and Bimex will cover 11,500 square meters. The fashion stores Boyner, YKM, C&A, M&S and Zara are also found in the shopping mall. A car parking lot with space for 5,500 vehicles. Forum Istanbul is home to a giant Ferris wheel that is as tall as the Bosphorus bridge, along with a bowling alley, restaurants, an IMAX movie theater, an ice-skating rink and playrooms for children. The largest attraction of this huge shopping center is Turkuazoo constructed on 8,000 square meters of land an aquarium housing 10,000 different species. Cevahir Shopping Centre holds a total gross area of 620,000 m² spread over six floors and cost $250 million to build. 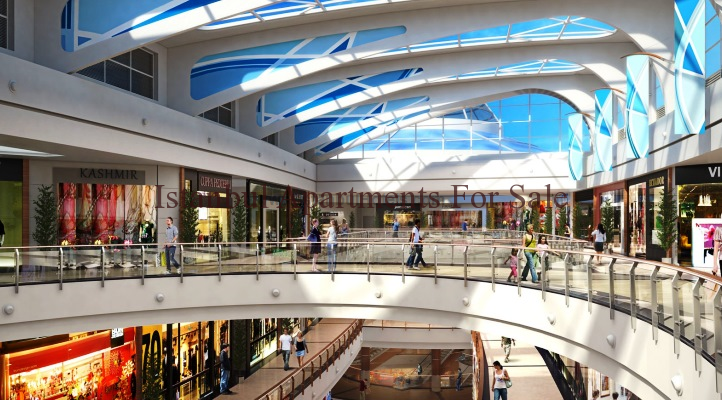 With 280 stores, 34 fast food restaurants and 14 exclusive restaurants in the shopping center. Istanbul Cevahir the second largest shopping mall in the world and largest mall in Europe. The building’s 2,500-m²-glass roof carries the biggest clock in the world, with digits each 3 m big. A roller coaster is spread in the interior of the shopping center. Inside there is a big stage for shows and other events, 12 cinemas including an IMAX 3D movie theater. It also has a cinema for children, along with several other entertainment facilities, and a bowling hall. Many international famous branded stores in the shopping center : Dorothy Perkins, Benetton, Esprit, Zara, Adidas, Dockers, Levi’s, Reebok, Converse, Best Mountain, Guess World, Guiseppo, Nine West, Starbucks, Burger King, McDonalds, KFC, and Pizza Hut. Astoria Istanbul Shopping Center has a well-balanced lifestyle space with a blend of leading Turkish and international brands. One of the newest tourist attractions in Istanbul, Europe’s Capital of Culture for 2010, due to the sequence of the Kempinski name with the world’s most favored and desirable brands. Astoria has a five storey shopping mall, located within an area of 120,000 square meters with a fascinating view of the entire Istanbul skyline. Two 27-storey towers that has 160 residence. Car parking for 1,000 vehicles, an entertainment area, a wellness, and fitness center . The 160 residences come in different sizes and can either be purchased or rented on short or long-term lease. Featuring everything from luxury restaurants and cafes serving cuisine from around the world, the world-famous Far Eastern Spa, Anantara, a fitness club with the latest high-tech workout equipment, and an indoor swimming pool to a multiplex cinema. City Nisantasi shopping center is situated on the street of Tesvikiye which is the middle of retail shopping in the elegant luxury district of Nisantasi Istanbul. The heart of fashion in Turkey is Nisantasi , the most influential national and international trademarks can be found here. The near location of the district to the palaces of Dolmabahçe and Yildiz, the effect of Pera culture, dwellers of many international perspectives and high purchasing power made Nisantasi a lively and cosmopolitan district. A historical districts of Istanbul. The most elite people lived in this neighborhood throughout its history. The development of the district starts when Sultan Selim the 3rd builds an archery drilling area (deep effects of European point of view could be observed on the Sultan). City Nisantasi project is prominent the top location in Istanbul with an investment of 125.000.000 Usd . City Nisantasi offers 150 stores, leading local and global brands, cafes and exclusive restaurants. Starbucks is on the first floor . The Restaurants are on the fourth floor. The famous Yummies food bar provides an international menu focusing on Italian specialties. Nest to it is the Mexican restaurant Cantina Mariachi, sizzling Mexican platters with guacamole and salsa. Suinn is a hip and chic Japanese and sushi eatery with modern minimalist Asia decoration and wonderful smells of fresh sushi rolls and green tea. Alongside is the first branch of the Etiler-based eatery Harvard Café that has a friendly atmosphere. Ben and Jerry’s homemade Ice Cream is on the same floor that opened its second store in Turkey after Kanyon. On the top level of City is a movie complex. Also, there is an excellent dining area with the Asian restaurant Celandon. Celadon has award-winning chefs and serves mostly Chinese food. Next to Celandon is a French restaurant, Clementine owned by Levent Penso. Another restaurant Grey which offers international cuisine,especially Italian food is also owned run by Levent Panso. Istanbul Sapphire is a shopping mall and luxury residence combination project and one of the tallest constructions in Istanbul. Standing high in Buyukdere Caddesi the heart of Istanbul’s new center. A highly environmentally friendly, energy effective building with upright gardens that conserve the relationship between nature and humans, featuring not only social and activity spaces but also Istanbul’s highest golf practice range. Istanbul Sapphire is ascending to take its place as Istanbul’s principal living environment. Enjoy breathtaking views of Istanbul from your garden 200 meters above street level. Istanbul Sapphire, is the highest building in Istanbul’s Levent business district. And the second tallest building in Istanbul and Turkey. Sapphire rises 54 storeys above ground level and boasts an above-ground roof height of 238 meters. The building has an overall structural height of 261 meters with its spire, part of the unique design. Sapphire Istanbul is the luxury residence project of Biskon Construction.